The way that we have managed and evaluated or abnormal PSA or prostatic specific antigen test has changed significantly over the last few years. The PSA test is the blood test in essence to assess the health of the prostate. Part of the issue that we have had with the test is that although it is specific for the prostate, the PSA test is not specific for one prostatic condition. There are three common conditions that can cause an elevation in this blood test. These include enlargement of the prostate, or BPH, which increases in frequency with age, inflammation of the prostate,or prostatitis, and prostate cancer itself. Previously, abnormalities in the PSA value would be evaluated with a Trans rectal ultrasound guided (TRUS) prostate biopsy. The main issue with this technique is that it involves the passage of needles through the rectal wall which in turn carries with it a ‘not insignificant’ risk of infection or sepsis after the biopsy. It is infection from the biopsy which is one of the main deterrents to undergoing PSA testing itself. Moving forward from this point a transperineal route has been more commonly adopted due to a reduction in the incidence of infection, and is certainly the standard way that we at the prostate clinic evaluate abnormal PSAs. In fact, over the last four years since adopting this transperineal or transcutaneous route for biopsying the prostate, we have yet to experience a single case of infection. 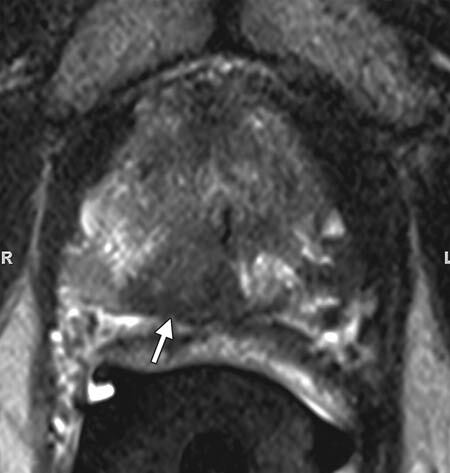 More recently, multiparametric MRI has come on the scene, and this facilitates obtaining an image of anatomical details within the prostate so that any subsequent biopsy can be performed in a more targeted fashion. The aim ultimately is to be more discerning about who undergoes a biopsy and when required, to perform this biopsy in a more specific targeted fashion. It should be mentioned that although a great advancement, an MRI itself is not 100% full proof and there are certain situations where an MRI will not detect significant prostate cancer. It is an excellent tool detecting discreet solitary lesions within the gland but is less useful for detecting less focal more diffuse lesions. It is for these reasons that a combination of both MRI and transperineal prostate biopsy are tailored according to the specific clinical scenario. For more information about the details of a Multiparametric MRI, please refer to our previous blog from our colleagues at South Coast Radiology from the 21st March 2014.